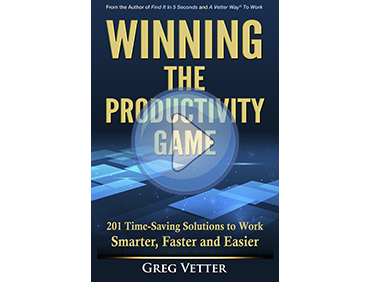 SPEECHES | Vetter Productivity, Inc.
Greg Vetter is a dynamic speaker who gets his audience involved in learning key organizational concepts. Humorous, witty and enthusiastic, Greg is, above all, an expert in organizational psychology. His approach and organizational system differ radically from the typical time management program. Instead he explores the underlying psychological issues, such as today’s addiction to technology, why the need for clutter, and fear of decision making, all of which keep people stuck. Do you check e-mail when it comes in? Then just leave it in your Inbox? Do you have hundreds, perhaps thousands of e-mails in your Inbox? Has the Search button become a necessity when looking for something? If you are like most people, you’ve probably never been taught a system of how to really be productive using e-mail. You follow the same commonly held practices that everyone else does—unfortunately, few being the most productive way to work. 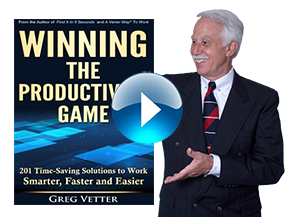 During this highly interactive, thought-provoking, and most of all, fun program, which combines lecture with audience participation, Greg identifies the most commonly held e-mail practices that cause you to lose hours of valuable time each week. You will then learn proven e-mail concepts from his 25+ years A Vetter Way® organizational system. 1. A quiz based on one’s e-mail practices is given. 3. Greg will discuss how the e-mail practice came about. 4. “Best practices” for using e-mail is discussed. Having paper a foot tall in an overflowing Inbox used to be bad enough. Now we are forced to endure a daily bombardment of nonstop e-mails and notifications. Many are just opened and left, cluttering our screen and overwhelming our lives. Some are never opened, burdening our already clogged e-mail programs. Unfortunately, few of us have ever been taught what to do with e-mails. Full of easy, practical and immediately usable information, audience members will learn a system of what to do with their e-mail, where to store it so they can find it in seconds, how to completely empty their Inbox, and most importantly, how to cut the time spent going through their e-mail by 50%. Processing information versus Producing work: Most people continually combine the two activities (multitasking) and then wonder why they don’t get more work done. Knowing the difference between the two is the most important concept for working productively in the Information Age today. Action versus Support: Understanding the difference between these two allows you to keep everything you need to work on separated (in one spot) from information you want to save. Many workers have everything mixed together in their Inbox or on their desk. Understanding the concept is the key to understanding how to be organized. Information flow: There are only four places e-mails can go from your Inbox: FADS (Forward, Action, Delete, Save). Once you understand the concept, you’ll feel confident knowing where all e-mails need to be moved to allowing you to completely empty your Inbox. These and other organizational myths abound in the workplace. During this highly interactive, thought-provoking, and most of all, fun program, which combines lecture with audience participation, Greg will identify, then dismantle, commonly held organizational beliefs. Greg will then explain A Vetter Way® to organize your office, paper, e-mail and computer. 1. We will start off with a quiz based on commonly held organizational beliefs. 2. You are asked if each of the beliefs are true or false. 3. We discuss how the myths came about. 4. The correct and most productive organizational concepts are explained.